Adam Melling has surfed thru to the final 16 of the O'Neill Highland Open. This is the sort of result he needs for his tilt at '09 WCT qualification. Good luck next round Mello. Adam Melling has won his way thru to the Quarter Finals in Scotland in chilly 2'-3' waves. Big points are on offer from here on, so smash it Mello ! 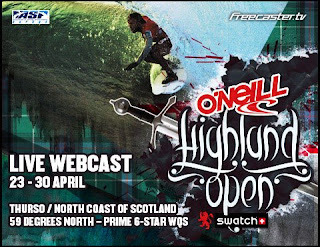 Adam has finished 2nd to fellow Aussie Adam Robertson at the O'Neill Highland Open in chilly inconsistent 2'-3'waves overnight. This result gives Mello 2625 WQS ratings points and really sets up a shot at the WCT. Congratulations Mello ! !